Enough to Storage: The dog leash has 2 buckles makes the leash easily fit anyone's waist. Sturdy and stretchy,this leash is strong enough to handle dogs of all shapes and sizes. High Quality: The dog leash is made of high quality weather resistant nylon and held together by strong ABS belt clips with strong metal clasps and D-Rings. Durability: Top quality materials,the dog training treat pouch is made of lightweight water resistant nylon fabric material that keeps your dog treats dry and fresh while you are educating your dog or just having fun walks. Portable: The convenient,spacious drawstring with a pouch are securely to hold pet treats,toys,mobile phone and extra things. Perfect for dog training outside. Different Ways to Use: There are several different ways for yours and your dog`s needs. 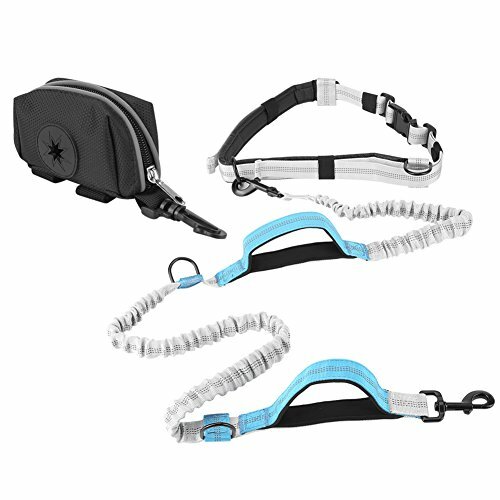 You can use it as normal lead, as double leash, as short leash, as training bungee or as a running leash.